Reset oil service light Jeep Compass. From years: 2008, 2009, 2010, 2011, 2012. How do you reset oil service light Jeep Compass. 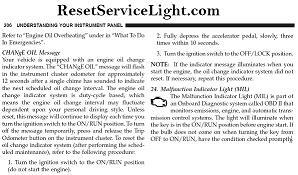 Reset CHANgE OIL Message Jeep Compass. Your vehicle is equipped with an engine oil change indicator system. The “CHANgE OIL” message will flash in the instrument cluster odometer for approximately 12 seconds after a single chime has sounded to indicate the next scheduled oil change interval. The engine oil change indicator system is duty-cycle based, which means the engine oil change interval may fluctuate dependent upon your personal driving style. Turn the ignition switch to the ON/RUN position, do not start the engine. Fully depress the accelerator pedal, slowly, three times within 10 seconds. Turn the ignition switch to the OFF/LOCK position. NOTE: If the indicator message illuminates when you start the engine, the oil change indicator system did not reset. If necessary, repeat this procedure. All information is taken from the Jeep Compass owners manual. That it is the full procedure how to reset oil service light Jeep Compass. If you like to reset any maintenance oil light after an oil change. Or reset check engine light, airbag light, inspection key or insp errors when maint reqd, for Jeep cars. Or any warning light for service reminder which appears on the display. Write in the search box the car name for which you want to find information, and find how to reset other service reminders when by yourself. Click hear to see full procedure how do you reset the oil light indicator. 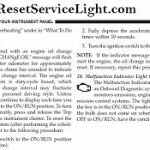 How to reset the maintenance light and how do you reset service light for all Jeep vehicles. I’m here to help with any problem! I had oil changed at scheduled time. Travel out of town 2 months later (430 miles) when back, change oil started to appear. Not due for another 3 months/ 3000 miles. Do I need to change oil again or only reset signal?? Will this happen after every trip? Do you need only to reset the signal.